Leopard plant (Ligularia spp. ): growing, planting, caring. A cousin of the Asters - ideal for large flowerbeds. Scientific name : Ligularia spp. 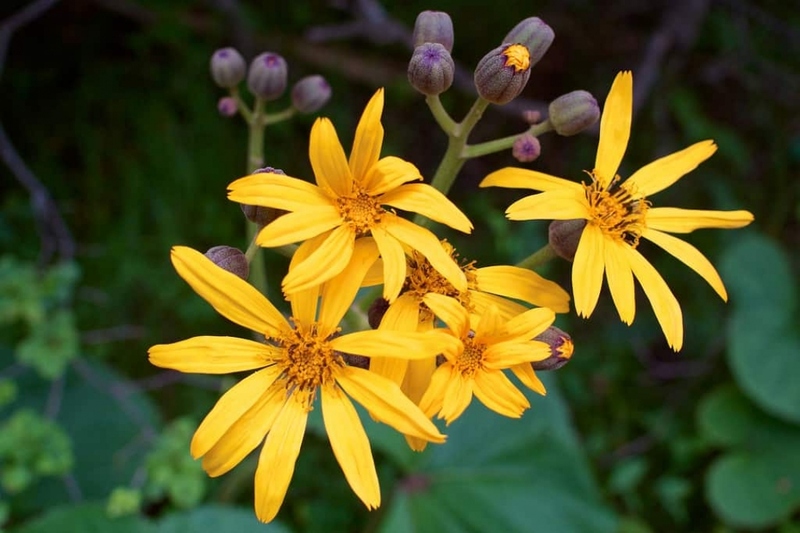 Ligularia is a genus of robust herbaceous perennial plants in the sunflower family, with yellow or orange composite flower heads with brown or yellow central disc florets. There are about 130 species in the genus - some species are cultivated as ornamentals. The cultivars ‘Britt Marie Crawford’, 'Gregynog Gold' and 'The Rocket' have gained the English Royal Horticultural Society's Award of Garden Merit. From the family of Asteraceae, the leopard plant carry large leaves in domed or triangular more or less cut, sometimes toothed. They are topped with panicles or ears of yellow or yellow-orange flowers. Plant your leopard plant in the sun or possibly in semi shade in neutral limestone soil, preferably heavy and moist. Prepare the soil by a digging (without necessarily turning it, with a pitchfork or a broadfork), a scratching and a raking. Plant the perennials keeping between 0.5 and 1.5 m between plants according to the species and the variety. Tamp the soil well to remove air around the roots, then water thoroughly. Leopard plant like rich soils, so a small input of mature compost over the topsoil after planting will be beneficial. During the first month, water once or twice a week. In case of drought, watch especially your ligularias, they prefer humidity. Water adult plants by big inputs even if you do it less often; the plant will develop a better root system if it has to fetch its water in depth. When watering, wait until the water that you pour stops rushing into the ground, and forms a small puddle. Do not wet the foliage, especially in the evening because it will be all the more attractive for molluscs. Your leopard plant will take 3 years to settle, so during this time you will need to weed occasionally to limit the competition. If you have mulched, weeding should not be too frequent. Mulch your leopard plant, they will thank you by asking less watering and weeding. As usual, use what you have on hand: dead leaves, dry grass clippings, crushed wood, etc. Put a reasonable layer of mulching, about 3-5 cm.